Becoming a new mom, whether it is your first time or your fifth time, can bring on a range of emotions from joy to anxiety. As the two of you begin to get to know one another, and as you learn how to best meet your little one’s needs, you will at times find yourself wondering (or even worrying) about their health and care essentials. Below are several of the most common concerns that all newborn parents face, and a few answers to give you better guidance as to how to handle these issues. 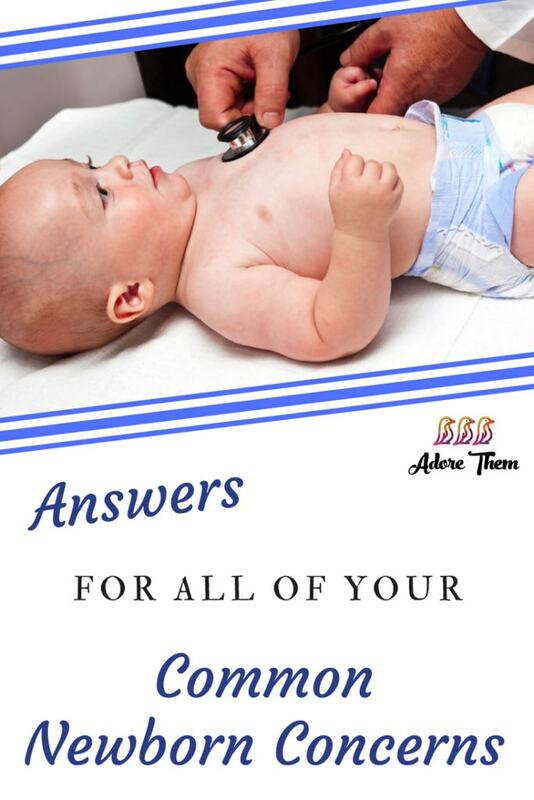 However, if you ever have questions – please reach out to your baby’s pediatrician right away. It is always better to be safe than sorry, and to catch something as early as possible. Any bleeding beyond the first minute after clamping or anything more than a drop or two of blood after the cord stump falls off. Redness around the umbilical cord area, especially if it occurs suddenly or gets worse over time. Baby is irritated or sensitive when that area is touched. Purulent discharge (or pus) like snot or boogers, but coming from the umbilical cord. Any foul smell from that area. Persistent bleeding or more than quarter-sized spot of blood on his diaper. Persistent redness more than five days after circumcision. Yellow discharge lasting more than a week. Any swelling beyond day 1. A significant change in appearance – for example, yesterday baby’s head was slightly jaundice but now all of baby is jaundice. Baby is sleeping excessively, and even too sleepy to feed or feed well. White rash on inside of baby’s mouth. Painful sores on mom’s breasts. Lime green frothy poop similar to algae – could be a sign of difficulties breastfeeding, or a stomach bug. Black coffee ground type poop AFTER baby’s poop transitions from meconium. This poop is thick and sticky and a sign that baby has some bleeding in their digestive tract. Red tinged poop, or poop with red flecks, that is normal in consistency could indicate a milk protein allergy. Red, bloody diarrhea is a sign of a bacterial infection that needs a doctor’s attention ASAP. Chalky white clay or playdough type poop is a sign of liver or gallbladder issues so call the doctor immediately. Red currant jelly poop consisting entirely of blood that has a “congealed fat” consistency as it indicates a serious bacterial infection that needs medical treatment quickly. Non-stop crying for more than 3 hours. Mucus in baby’s stool two or more times in a few hours or days. A significant decrease in the number of wet diapers a baby has per day, especially if it’s not resolved with increasing their breastmilk or formula intake. Excessive sleepiness or lethargy, especially if they are having difficulty feeding because they are too sleepy. Any bleeding that doesn’t quickly resolve when pressure is applied to the area. When you leave the hospital, consider that your baby’s “normal” and contact the doctor if there are any clear or immediate changes in this new “norm.” You know your baby best, so when in doubt, always consult with your doctor’s office. They are happy to answer calls from new parents who they understand are still absorbing copious amounts of information about baby and have a plethora of questions. They really do expect your calls for all things big and small, so don’t fret about this rite of passage as a new parent and call your doctor whenever you suspect something is wrong! In the best cases, you’ll catch something serious early. And if you’re wrong, you’ll at least have a good laugh later about how your doctor told you not to worry. Of course, this won’t be the end of your well baby visits during baby’s first few years of life, but it does cover baby’s first 3 months! You’ll be back to the doctor’s every 2 to 3 months until baby’s first birth day and then 3 more times before they turn 2. Specifically, you can plan on check ups at 4 months, 6 months, 9 months, and 12 months with additional visits at 15 month, 18 months, and 24 months. It’s a ton of time spent at the doctor’s office, but you’ll be happy to do it to ensure your baby’s healthy, happy, and developing normally! For additional info on how to best prepare for your little one’s doctor appointments, please read How to Best Prepare for Your Baby’s First Pediatrician Appointment.